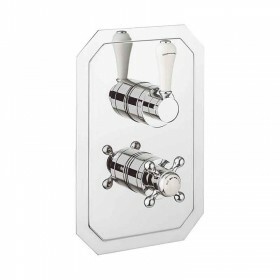 Elegant period design with easy to use lever controls with porcelain detailing. 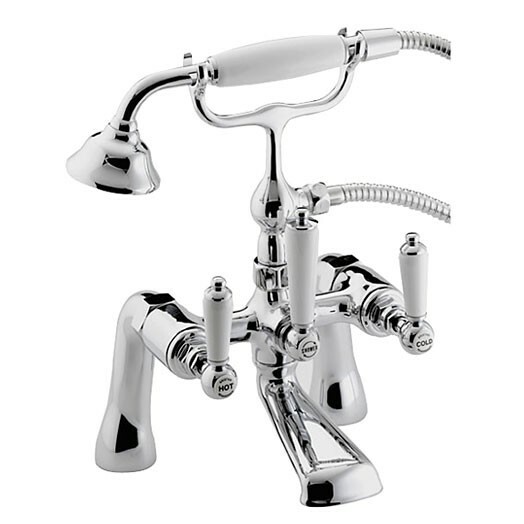 The attention to detail and superb quality makes the renaissance bathroom taps very distinctive. The easy to use white porcelain handles add to the authentic traditional styling of this range, which is sure to create an elegant tranquil space within any traditional bathroom. This mixer tap is for baths with two tap holes. 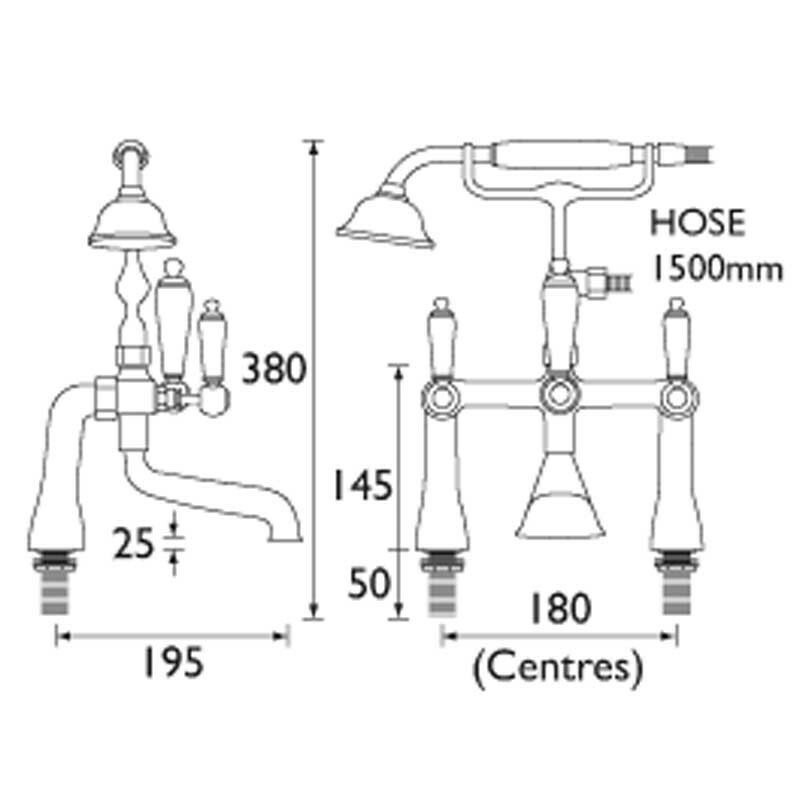 It is supplied complete with a 1.5m shower hose and a single function shower handset. There are ceramic disc valves within for an easy to use quarter turn control. 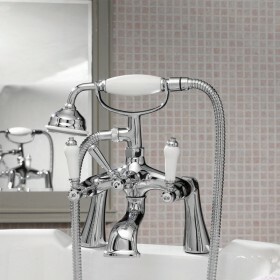 The Renaissance bath shower mixer is only available in chrome plated finish as shown. The cold side of this tap leaked on fitting, the ceramic cartridge is faulty. Bristan would not deal with me as they had not received the proof purchase or guarantee slip. This is a poor tap and an equally poor manufacturer that just refused to help me. Net result is an unhappy customer and a... Read More. The cold side of this tap leaked on fitting, the ceramic cartridge is faulty. Bristan would not deal with me as they had not received the proof purchase or guarantee slip. This is a poor tap and an equally poor manufacturer that just refused to help me. Net result is an unhappy customer and a very unhappy installer. For £300 you would have expected a lot more. Service rating : Extremely helpful. I sent a photo of our existing taps and they kindly sent me exact replica. Delivered promptly and on time. Boxes holding taps were dented but taps seem OK. Will check tgeir condition carefully with plumber. Service rating : Promised update on where the tap spares for a brand new tap never materialised, although Tapstore did deal with Bristan for me. This is one of those occasions when I wish I had gone to my normal merchant and swallowed the extra cost. 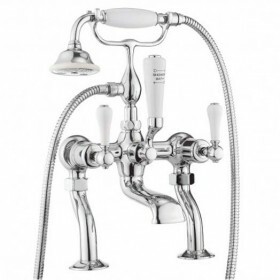 Product : The cold side of this tap leaked on... Read More. Service rating : Promised update on where the tap spares for a brand new tap never materialised, although Tapstore did deal with Bristan for me. This is one of those occasions when I wish I had gone to my normal merchant and swallowed the extra cost. Product : The cold side of this tap leaked on fitting, the ceramic cartridge is faulty. Bristan would not deal with me as they had not received the proof purchase or guarantee slip. This is a poor tap and an equally poor manufacturer that just refused to help me. Net result is an unhappy customer and a very unhappy installer. For £300 you would have expected a lot more. We are very sorry that there was an issue. As discussed on the telephone we have forwarded the required proof of purchase to Bristan and the requested cold cartridge is being sent direct to you. If this part does not arrive please do not hesitate to contact either via phone or email. Product : Not delivered yet! Service rating : Very good service, easy online and very quick delivery. Product : Product will be fitted soon. It matches the basin taps so there was no choice! However, I have been a little disappointed with the taps as the hot/cold discs at the top have faded.